ERAI links together companies from over 40 countries spanning six continents. 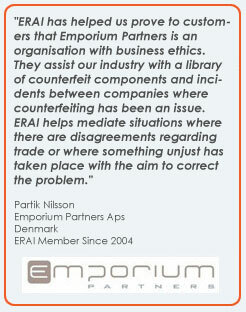 ERAI invites companies from around the globe to apply for membership and join our international network of companies sharing data to stop the proliferation of counterfeit electronics. ERAI also sources and consolidates market data from all over the world. The absence of geographical restrictions enables ERAI to provide its Members with the largest repository of counterfeit and nonconforming parts as well as insight into the backgrounds of thousands of international companies that comprise the global electronic supply chain.